Well folks, the holidays are upon us! While this is the most wonderful time of the year, we’ve all had our difficulty with finding the perfect gifts for those we love. A leading trend this year that has been seen on numerous runways and street wear is animal print. Designers for luxury and affordable brands alike have incorporated animal print into their garments and products, making this trend more popular than ever. I am a huge fan of this trend and have a lot of animal print clothing as well as accessories and products such as phone cases. If you know fashion forward women in your life who love animal print, I highly suggest you find items in this trend to gift to them this holiday season. As with all things fashion, there are some items that are expensive quality products, while other similar products can be found at more affordable price points depending on where you shop and who you are buying for. This Tory Burch animal print hard shell phone case is incredibly fashionable and the color looks excellent with the print. It makes for a wonderful holiday gift and can be used year round due to the neutral color. Victoria’s Secret apparel is great quality and they know how to attract their target market. This VS Sparkle Leopard Print top is an excellent choice for the fashionable young women in your life. While Dolce & Gabbana may be out of many of our price ranges, this Leopard Print Neck Blouse can be purchased at Nordstrom for a more reasonable price and would be an elegant gift for someone special in your life. How do you guys incorporate this trend into your looks? Happy Thanksgiving weekend everybody! I hope you all spent it with loved ones and lots and lots of delicious food, I certainly did! This Thanksgiving was especially meaningful to me because last month my dad had intense surgery to remove the tumor that was surrounded by other organs that also had to be removed. We are so grateful that they got it in time and although he has a long recovery ahead, he is one tough cookie and is pulling through. Now lets get down to business, what did you guys make this year that is so yummy you have to share with me?! 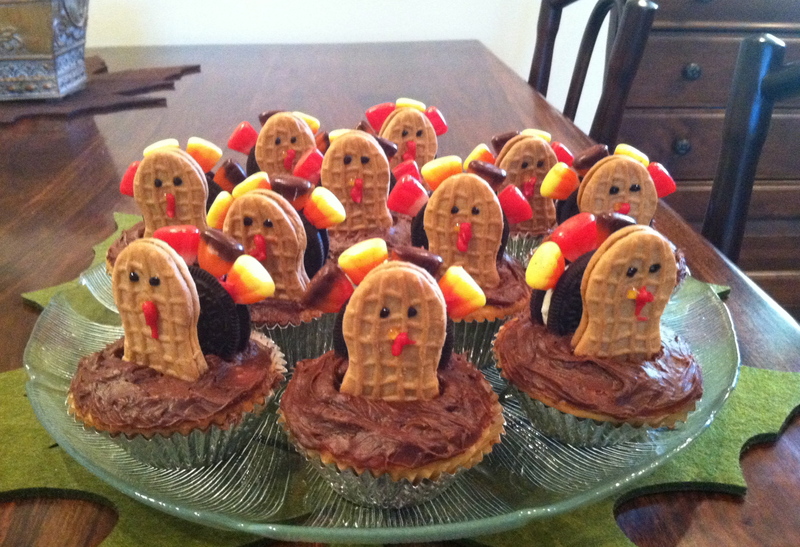 Thanks to my obsession with Pinterest, I made some adorable Turkey Cupcakes. Not only were they cute, but they were scrumptious as well. After stuffing my face for a full day, I decided to work off the pounds with some Black Friday shopping, I mean, that counts as cardio..right?! My mom and I decided to skip the craziness at the mall and instead went to the outdoor shopping avenue near our home. I got incredibly great deals at VANS and bought some comfy jackets for this cold weather. We then went to Francesca’s boutique (which I LOVE by the way,) and I couldn’t believe the great deals that they had going on as well. 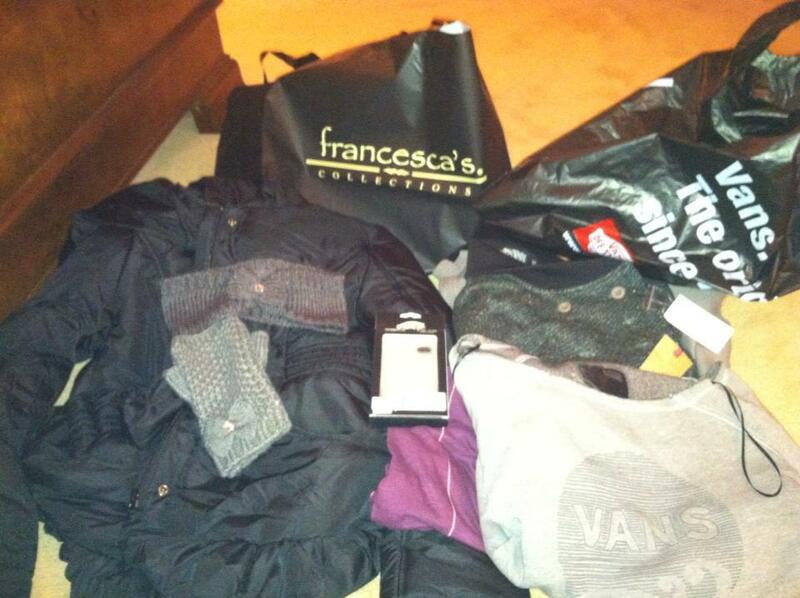 I got a cute belted snow jacket for 40% off and of course couldn’t resist some scarf headbands and matching gloves. Did any of you go Black Friday shopping, what was your experience like? Street Style is a huge inspiration for me, from friends to strangers, street fashion is a huge part of the industry. 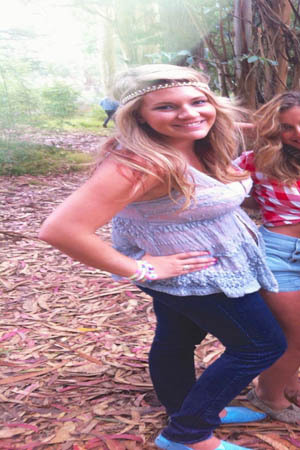 This is Heidi, she is 21 years old and lives in Santa Cruz, California. Heidi is a nursing student, as well as a fashionista. I took this photo of her in Golden Gate Park in the city. What attracted me to her look was the youthfulness and uniqueness that came across in her ensemble. When I asked her how she would define her own style she said that she would consider herself a “modern, feminine, fashionable hippy,” a description I loved! She said that she loves creating her own looks and playing with accessories, as seen from her hip headband and bracelets. She said that in her opinion fashion means being able to express yourself through clothes and creating looks that make you feel confident. As many of you now, there is a large number of us in the world who have a strong addiction to purses. Some may say that this is a serious problem, but I say life’s too short not to buy the purse! I decided to interview my oldest friend Simonne; one of the biggest purse-aholics I know, who is a savvy fashionista and also just got promoted to manager at Burberry. The goal of my interview was to find out just how her love for purses started and if working in the designer fashion industry furthered her obsession or mellowed it out. How old were you when you started collecting purses? I think it started when I was about 6 and my mom would get me those little pink plastic purses that carried a compact and a small lip balm. Even though I didn’t’ buy that myself I thought it was so cool to be able to carry my things around in a cute purse and I wanted to have it in all different colors and patterns, so whenever I got chore money I would ask my mom to take me to get more. I remember those. What influenced you to start buying designer brands? When I got to middle school I would see other girls with the new Dooney and Bourke purses and wanted to have one too. It sounds so juvenile now that I look back, but I really did see designer purses like that as being cool and that drove me to want one even more. I would ask for them for Christmas or a special occasion and slowly but surely my collection of “big girl” purses began. What is it about purses that you are attracted to? In my opinion purses are the best accessories. You can be dressed in sweats and a tank top but if you have a fierce purse over your shoulder, you’re golden. There is also such a wide range of purses that you can never get bored with them. Aside from their functional contributions, on many levels they are a status symbol. Similar to clothes, purses can reflect your personality and be simple and classic to loud and modern. Do you have a favorite purse brand, and if so what makes that brand stand out to you? Burberry has been one of my favorite brands for as long as I can remember. The classic pattern is like a little black dress in that it will never go out of style and can go with so many things. I also pay a lot of attention to quality, because even though I don’t always buy designer, if I am going to spend a fair amount of money on a product, it needs to be of excellent design, which I find in Burberry products. Speaking of Burberry, did your love for purses influence your career choices? I would say absolutely, just because my passion for purses introduced me to the world of fashion in general. When I was little I used to want to be a purse designer and the more I collected, the more brands I became familiar. This opened my eyes to the wide world of fashion retail and designer, and I knew that I wanted to work in the fashion industry in one way or another. So purses were a steppingstone that led you to the fashion industry? Definitely. If I didn’t get so involved in purses, I can’t say for sure that I would be as involved in the fashion industry as I have been, and now I can’t imagine being in any other industry. Has working for Burberry increased your brand loyalty or do you still purchase purses from other companies? Congratulations on your latest promotion to manager, how has the sense of responsibility changed for you? Thank you very much. It has changed a lot because now people look to me for answers and guidance, whereas before I was the one who relied on someone else and would do the work I was told to do without much thought put into it. What would you tell someone who is considering a career in fashion? I would tell them to, above all else, follow their passion. Although I changed my mind on what I wanted to do in life probably a million times, I knew my heart was in fashion and I have followed my heart all along. I would tell them to start with a successful company, even if that means having to be a gopher, because that way you can prove yourself and eventually begin to work your way up. Where do you see your career headed in the future? I see myself working for a company such as the one I am at now, and eventually entering the world corporate management. I have a degree from UC Davis but have been considering going back to school for a Master’s Degree that is geared toward fashion in order to gain high end positions. That sounds like a great plan. Who knew a purse passion could lead to such a great job in fashion? Thank you for meeting with me. Fashion Fight, Claws are Out! It’s said that the fashion industry is full of catty individuals, well whether that’s true or not, fights do ensue. Raf Simons is the designer who took over at Dior, while Hedi Slimane is the designer over at Saint Laurent. All eyes were on these designers with intense anticipation for their spring debuts, however the real drama was taking place off of the catwalk. Tensions rose between Cathy Horyn, famous for her work at the New York Times, and Hedi Slimane. Now this is where things get complicated, so bear with me. Many years ago, Horyn wrote a piece on her blog about how if it wasn’t for designer Raf Simons there would be no Hedi Slimane, and how that is the reason why she is not invited to his shows. 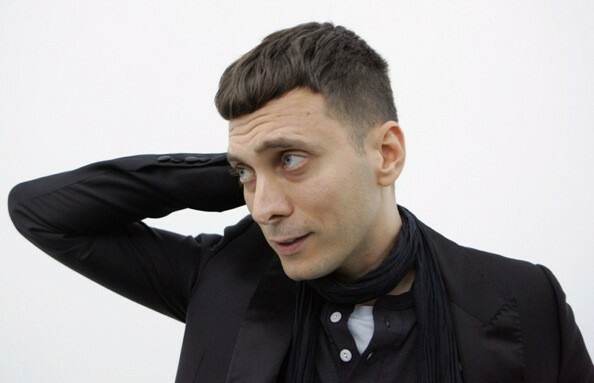 Slimane quickly fired back on his Twitter and said many things about Horyn, including that she is a “schoolyard bully” and that her “sense of style is seriously challenged.” His response goes on for a while and concludes with him saying how she will never have a seat at a Saint Laurent show. Many people in the industry are taking sides and a lot of journalists are unimpressed by Slimane’s approach and way of dealing with the issue at hand. At a time when Saint Laurent is trying to rebrand itself, I would say this argument is extremely poor timing. Now, can’t we all just get along? Every year I look forward to seeing new and inspiring talent at the Academy of Art University Runway Show in New York. This year was no exception, and while I was mesmerized by many of the collections, designer Ginie C.Y. Huang’s show was my favorite. For those of you who don’t know me, I am a huge fan of bright colors; bright dresses, bright running shoes, I love any all things bright. This collection was a burst of energy, from the bright green jackets to the enchanting fuchsia dresses. The lush color palette represented the freshness of spring and the colors used flattered each other without being overdone. Feathers accented the garments harmoniously and complimented the silhouettes, allowing for wonderful movement as the models worked the runway. The use of minimal trims and no patterns worked for her advantage, as our attention was focused on the silhouettes and colors, which were the main attraction. In her next collection I would like to see her play around with prints and incorporate them with her exquisite color choices. Textiles used in this collection included silk organza and wool, making for beautifully unique and comfortable pieces perfect for the spring season. Dresses were feminine and form fitting, accentuating the models figures without being clingy. Ginie is clearly a designer who is not afraid to have fun with fashion and her bright and bold collection was a breath of fresh air from the run of the mill staple colors we see in almost every other collection. Reminiscent of 1960’s silhouettes, the playful colors and retro glasses transported me back in time. The collection as a whole worked extremely well together and I wish that I could fast forward in time to see these pieces worn. If you, like me, love bright and beautiful collections, make sure you check out Ginie’s Spring 2013 Runway Show, believe me you won’t be sorry. She is a designer to watch and I’m really looking forward to what she presents to us in the future. 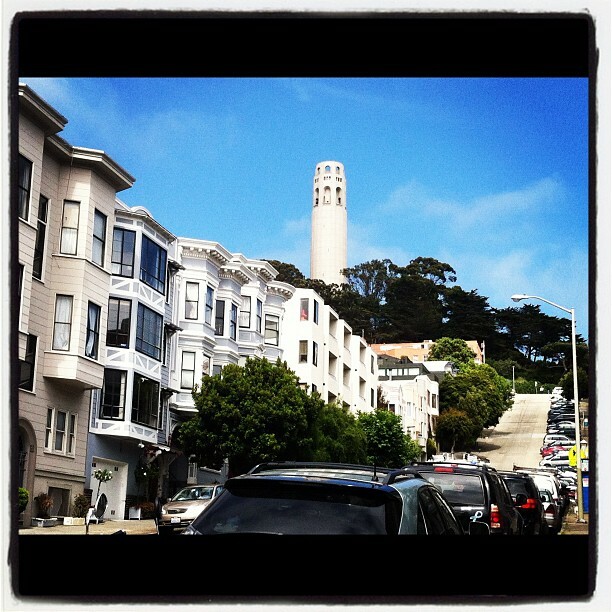 Entering the big wide world of Blogging! I am proud to say this is my first post as a brand new blogger. I’m excited to start sharing my life with the rest of you savvy bloggers. My life consists of school, work, food, fashion, friends, family and of course my dogs, who I’m sure you’ll see more than enough of as time goes on!! My greatest fashion inspiration is street wear, and I see such a wide range of it living here in the city. I also get inspired by my friends, who are all so different and unique when it comes to their personal style. This blog is going to be devoted to sharing the fashion I see and wear, as well as the food I love and other odds and ends from my life.